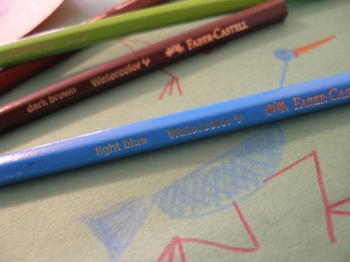 Do your kids have these faber-castell colored pencils? They’re fantastic. You can draw with them and then take a wet paintbrush over your work to make it look more like a watercolor painting. Packing up orders from my etsy shop and sending swaps over the ocean. Sewing projects that fall more in the category of clothing rescue and reconstruction than anything else. Cutting off stained cuffs and adding a little trim, patching knees and fixing torn seams. Cleaning out two closets to finally give my husband a place to hang his clothes in our small home. I’ve been putting it off because it meant going through my four shelves of fabric and sewing supplies and condensing it all into one shelf that would fit in my own closet. Ouch. It meant keeping out only the things that I absolutely LOVED and thought I would use soon. It was kind of like sorting through my fabric by season–leaving out corduroy and browns, reds and mossy greens. But it was worth it just to give him some space of his own. I’ve also caught up on ALL my laundry and managed to keep my house somewhat picked up–a new goal of mine–to always have the house pop-in ready or at least pretty close to that. 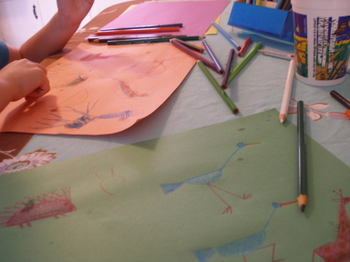 And of course, we’ve also been doing the most important things like sitting around the table and drawing silly ed emberley drawings, and painting pictures with just dots of paint and going for walks and raking leaves and picking up sticks and lingering too long in bed….the things that make life worth doing. I love your little haybabies! 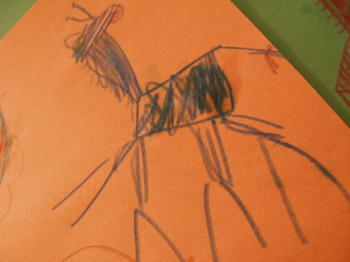 Love the drawings and those pencils are very cool.The hay costumes are just too good Molly. he. Making me smile. I used to have an old discarded Ed Emberly book. The Purple Drawing Book, I think. I drew the pictures in it all the time! Those hay bales are the cutest… how did they get in the middle? 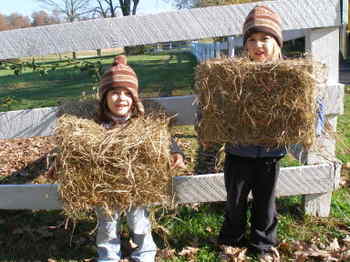 Very funny hay bales. LOVE them! those hay bales are so cute!!! what kids will do for candy…. so you’ve been busy doing what really matters, huh?? Hi, just dropped by to say I tried your pumpkin bread recipe and it turned out great! Thanks a lot for sharing! I have those pencils and I love them. My favorite gift for little kids is a decent-sized set of watercolor pencils (I confess that I buy cheaper for kids, usually), a watercolor sketchpad, a small set of brushes and the best pencil sharpener in the world (closed on both ends, three holes for all sizes) and put it all in a totebag with an iron on thing identifying the kid. I can buy all of this, usually in the Loew’s brand, from Hobby Lobby for under $20 and it’s a huge hit with girls and boys. Next Next post: A good swap indeed.